A "secondary" mineral is one which is derived by a physicochemical reaction from a primary mineral in bedrock or detritus, and/or deposited because of a unique set of conditions in a cave; i.e., the cave environment has influenced the mineral's deposition. Over time the accumulation of these precipitates form stalagmites, stalactites, and flowstones, which compose the major categories of speleothems. Calthemites which occur on concrete structures, are created by completely different chemistry to speleothems. Include forms known as ribbon helictites, saws, rods, butterflies, hands, curly-fries, and "clumps of worms"
Cryogenic calcite crystals are loose grains of calcite found on the floors of caves, and are formed by segregation of solutes during the freezing of water. Speleothems made of sulfates, carbonates, mirabilite or opal occur in some lava tubes. Although sometimes similar in appearance to speleothems in caves formed by dissolution, lava stalactites are formed by the cooling of residual lava within the lava tube. Speleothems formed from salt, sulfur and other minerals are also known. Speleothems made of pure calcium carbonate are a translucent white color, but often speleothems are colored by chemicals such as iron oxide, copper or manganese oxide, or may be brown because of mud and silt particulate inclusions. 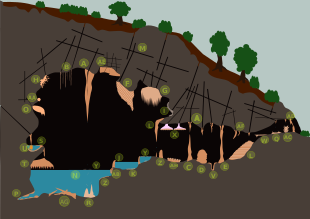 Many factors impact the shape and color of speleothem formations including the rate and direction of water seepage, the amount of acid in the water, the temperature and humidity content of a cave, air currents, the above ground climate, the amount of annual rainfall and the density of the plant cover. Most cave chemistry revolves around calcium carbonate (CaCO3), the primary mineral in limestone and dolomite. It is a slightly soluble mineral whose solubility increases with the introduction of carbon dioxide (CO2). It is paradoxical in that its solubility decreases as the temperature increases, unlike the vast majority of dissolved solids. This decrease is due to interactions with the carbon dioxide, whose solubility is diminished by elevated temperatures; as the carbon dioxide is released, the calcium carbonate is precipitated. Speleothems are studied as climate proxies because their location within cave environments and patterns of growth allow them to be used as archives for several climate variables. The principal proxies measured are oxygen and carbon isotopes and trace cations. These indicators, alone and in conjunction with other climate proxy records, can provide clues to past precipitation, temperature, and vegetation changes over the last ~ 500,000 years. A particular strength of speleothems in this regard is their unique ability to be accurately dated over much of the late Quaternary period using the uranium-thorium dating technique. Stable isotopes of oxygen (δ18O) and carbon (δ13C) are recorded well in speleothems, giving high-resolution data that can show annual variation in temperature (oxygen isotopes primarily reflect rainfall temperature) and precipitation (carbon isotopes primarily reflect C3/C4 plant composition and plant productivity, but the interpretation is often complicated). By sampling along a dated transect of a speleothem, these isotope values and speleothem growth rates provide a paleoclimate records similar to those from ice cores. Variations in precipitation alter the width of new ring formation, where close ring formation shows little rainfall, and wider spacing for heavier rainfall. The geometrical way in which stalagmites grow is also used in paleoclimate applications, which varies based on the height the water is falling from, and the rate of flow. Weaker flows and short travel distances form more narrow stalagmites, while heavier flow and a greater fall distance tends to form more broad ones. Additionally, drip rate counting and trace element analysis on the water drops themselves have been shown to record shorter-term variations in the climate at high resolution, such as drought conditions attributed to the El Niño-Southern Oscillation (ENSO) climate events. A recent technique is the use of CT-scanning on intact specimens to analyze density, where more dense speleothem development indicates higher moisture availability. Another dating method using electron spin resonance (ESR) — also known as electron paramagnetic resonance (EPR) — is based on the measurement of electron-hole centers accumulated with time in the crystal lattice of CaCO3 exposed to natural radiations. In principle, in the more favorable cases, and assuming some simplifying hypotheses, the age of a speleothem could be derived from the total radiation dose cumulated by the sample and the annual dose rate to which it was exposed. Unfortunately, not all the samples are suited for ESR dating: indeed, the presence of cationic impurities such as Mn2+, Fe2+, or Fe3+, humic acids (organic matter), can mask the signal of interest, or interfere with it. Moreover, the radiation centers must be stable on geologic time, i.e., to have a very large lifetime, to make dating possible. Many other artifacts, such as, e.g., surface defects induced by the grinding of the sample can also preclude a correct dating. Only a few percents of the samples tested are in fact suitable for dating. This makes the technique often disappointing for the experimentalists. One of the main challenge of the technique is the correct identification of the radiation-induced centers and their great variety related to the nature and the variable concentration of the impurities present in the crystal lattice of the sample. ESR dating can be tricky and must be applied with discernment. It can never be used alone: "One date only is No date", or in other words, "multiple lines of evidence and multiple lines of reasoning are necessary in absolute dating". However, "good samples" might be found if all the selection criteria are met. Secondary deposits derived from concrete, lime, mortar or calcareous material as found on man-made structures outside the cave environment or in artificial caves (e.g. mines and tunnels), can mimic the shapes and forms of speleothems, but are classed as calthemites. The occurrence of calthemites is often associated with concrete degradation, but could also be linked to leaching of lime, mortar or other calcareous material (e.g. limestone and dolomite). 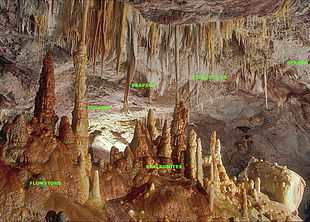 Despite similar appearances, "calthemites" (created outside the cave environment) are not considered to be "speleothems" (created inside the cave environment), and vica versa, as per their definitions. Various formations in the Hall of the Mountain Kings, Ogof Craig a Ffynnon, South Wales, Great Britain. Stalactites and columns in Natural Bridge Caverns, Texas, U.S..
More Formations in Natural Bridge Caverns, Texas, U.S..
Cave curtain formation in the Marble Arch Caves, County Fermanagh, Northern Ireland. California Caverns, Calaveras County, California; one of many caverns located in the Sierra Foothills of California. Stalagnates (columns) in the cave Biserujka, Dobrinj, Island Krk, Croatia. ^ a b Moore, G W. (1952). "Speleothems – a new cave term". National Speleological Society News, Vol.10(6), p.2. ^ Onac, Bogdan; Forti, Paolo (2011). "State of the art and challenges in cave minerals studies". Studia Universitatis Babes-Bolyai, Geologia. 56 (1): 33–42. doi:10.5038/1937-8602.56.1.4. ISSN 1937-8602. ^ Hendy, C. H (1971-08-01). "The isotopic geochemistry of speleothems—I. The calculation of the effects of different modes of formation on the isotopic composition of speleothems and their applicability as palaeoclimatic indicators". Geochimica et Cosmochimica Acta. 35 (8): 801–824. Bibcode:1971GeCoA..35..801H. doi:10.1016/0016-7037(71)90127-X. ^ White, William (2012). "Speleothem microstructure/speleothem ontogeny: a review of Western contributions". International Journal of Speleology. 41 (2): 329–358. doi:10.5038/1827-806x.41.2.18. ISSN 0392-6672. ^ White, William (2016-02-09). "Chemistry and karst". Acta Carsologica. 44 (3). doi:10.3986/ac.v44i3.1896. ISSN 0583-6050. ^ Zak Karel, Karel; Urban, Jan; Cilek Vaclav, Cilek; Hercman, Helena. "Cryogenic cave calcite from several Central European caves: age, carbon and oxygen isotopes and a genetic model". Speleogenesis Scientific Network. Archived from the original on 2 February 2016. Retrieved 28 January 2016. ^ a b Fairchild, Ian J.; Smith, Claire L.; Baker, Andy; Fuller, Lisa; Spötl, Christoph; Mattey, Dave; McDermott, Frank; E.I.M.F. (2006-03-01). "Modification and preservation of environmental signals in speleothems". Earth-Science Reviews. ISOtopes in PALaeoenvironmental reconstruction (ISOPAL). 75 (1–4): 105–153. Bibcode:2006ESRv...75..105F. doi:10.1016/j.earscirev.2005.08.003. ^ Richards, David A.; Dorale, Jeffrey A. (2003-01-01). "Uranium-series Chronology and Environmental Applications of Speleothems". Reviews in Mineralogy and Geochemistry. 52 (1): 407–460. doi:10.2113/0520407. ISSN 1529-6466. ^ McDermott, Frank (2004-04-01). "Palaeo-climate reconstruction from stable isotope variations in speleothems: a review". Quaternary Science Reviews. Isotopes in Quaternary Paleoenvironmental reconstruction. 23 (7): 901–918. Bibcode:2004QSRv...23..901M. CiteSeerX 10.1.1.325.452. doi:10.1016/j.quascirev.2003.06.021. ^ Li, Zheng-Hua; Driese, Steven G.; Cheng, Hai (2014-04-01). "A multiple cave deposit assessment of suitability of speleothem isotopes for reconstructing palaeo-vegetation and palaeo-temperature". Sedimentology. 61 (3): 749–766. doi:10.1111/sed.12078. ISSN 1365-3091. ^ "Picture Climate: What Can We Learn From Caves? | NOAA Climate.gov". www.climate.gov. Retrieved 2017-04-29. ^ McDonald, Janece; Drysdale, Russell; Hill, David (2004-11-01). "The 2002–2003 El Niño recorded in Australian cave drip waters: Implications for reconstructing rainfall histories using stalagmites". Geophysical Research Letters. 31 (22): L22202. Bibcode:2004GeoRL..3122202M. doi:10.1029/2004gl020859. ISSN 1944-8007. ^ Walczak, Izabela W.; Baldini, James U. L.; Baldini, Lisa M.; McDermott, Frank; Marsden, Stuart; Standish, Christopher D.; Richards, David A.; Andreo, Bartolomé; Slater, Jonathan (2015-11-01). "Reconstructing high-resolution climate using CT scanning of unsectioned stalagmites: A case study identifying the mid-Holocene onset of the Mediterranean climate in southern Iberia". Quaternary Science Reviews. Novel approaches to and new insights from speleothem-based climate reconstructions. 127: 117–128. Bibcode:2015QSRv..127..117W. doi:10.1016/j.quascirev.2015.06.013. De Cannière, P.; Debuyst R.; Dejehet F.; Apers D.; Grün R. (1986). "ESR dating: a study of 210Po-coated geological and synthetic samples". Nuclear Tracks and Radiation Measurements. 11 (4–5): 211–220. doi:10.1016/1359-0189(86)90037-3. Grün, R. (1989). "Electron spin resonance (ESR) dating". Quaternary International. 1 (1): 65–109. Bibcode:1989QuInt...1...65G. doi:10.1016/1040-6182(89)90010-4. Grün, R. (1989). "ESR dating for the early Earth". Nature. 338 (6216): 543–544. Bibcode:1989Natur.338..543G. doi:10.1038/338543a0. Hennig, G.J. ; Grün R. (1983). "ESR dating in quaternary geology". Quaternary Science Reviews. 2 (2–3): 157–238. Bibcode:1983QSRv....2..157H. doi:10.1016/0277-3791(83)90006-9. Ikeya, M. (1984). "Age limitation of ESR dating for carbonate fossils". Naturwissenschaften. 71 (8): 421–423. Bibcode:1984NW.....71..421I. doi:10.1007/BF00365890. Jonas, M. (1997). "Concepts and methods of ESR dating". Radiation Measurements. 27 (5–6): 943–973. Bibcode:1997RadM...27..943J. doi:10.1016/S1350-4487(97)00202-3. Nambi, K.S.V. ; Aitkin M.J. (1986). "Annual dose conversion factors for TL and ESR dating". Archaeometry. 28 (2): 202–5. doi:10.1111/j.1475-4754.1986.tb00388.x. Radtke, U.; Mangini A.; Grün R. (1985). "ESR dating of marine fossil shells". Nuclear Tracks and Radiation Measurements. 10 (4–6): 879–884. doi:10.1016/0735-245X(85)90103-6. Radtke, U.; Grün R. (1988). "ESR dating of corals". Quaternary Science Reviews. 7 (3–4): 465–470. Bibcode:1988QSRv....7..465R. doi:10.1016/0277-3791(88)90047-9. Rink, W.J. (1997). "Electron spin resonance (ESR) dating and ESR applications in quaternary science and archaeometry". Radiation Measurements. 27 (5–6): 975–1025. Bibcode:1997RadM...27..975R. doi:10.1016/S1350-4487(97)00219-9. Sato, T. (1982). "ESR dating of planktonic foraminifera". Nature. 300 (5892): 518–521. Bibcode:1982Natur.300..518S. doi:10.1038/300518a0. Skinner, A.R. (2000). "ESR dating: is it still an 'experimental' technique". Applied Radiation and Isotopes. 52 (5): 1311–1316. doi:10.1016/S0969-8043(00)00089-0. PMID 10836448. ^ a b c Smith, G.K., (2016). "Calcite Straw Stalactites Growing From Concrete Structures", Cave and Karst Science, Vol.43, No.1, P.4-10, (April 2016), British Cave Research Association, ISSN 1356-191X. ^ Macleod, G, Hall, A J and Fallick, A E, (1990). "An applied mineralogical investigation of concrete degradation in a major concrete road bridge". Mineralogical Magazine, Vol.54, 637–644. V.A.Maltsev, C.A.Self. Cupp-Coutunn cave system, Turkmenistan, USSR // Proceedings of Bristol University speleological society, 1992, vol.19, p. 117-150. Self, Charles A.; Hill, Carol A. (2003). "How speleothems grow: An introduction to the ontogeny of cave minerals" (PDF). Journal of Cave and Karst Studies. 65 (2): 130–151. ISSN 1090-6924. Retrieved 2010-06-30. Wikimedia Commons has media related to Speleothems.